Cool cottons and linens, soft flannel and baby cord – a lovely selection of blouses for women in beautiful fabrics. Quality. Guaranteed. For versatility, you can't beat having a good selection of womens blouses in your wardrobe. They can be dressed up or down to suit the occasion, and give a more polished look to just about any outfit, whether that's for the office, worn under a suit, or at the weekends tucked into your jeans or worn loose (jacket like) over a T-shirt. Available in such a wide variety of fabrics, from the lightest weight cottons, like our crisp, fresh, non-iron shirts, and summery linen shirts for spring and summer – to warmer styles that take the chill off in autumn and winter, you can rely on there being a womens blouse for every occasion and every season. For example, famous for cosy warmth and a softer than soft feel against your skin are the brushed flannel shirt, the chambray shirt and the babycord shirt. These started out as men's casual work shirts (which we women soon appropriated for our own use) and have a long history of comfortable, durable wear during the colder months of the year. Linen and cotton, being breathable fabrics, are more suited to warmer weather. Of course, the styling details will also dictate which season a blouse should be worn in: short sleeves and sleeveless blouses in spring and summer, long sleeves for cooler days. 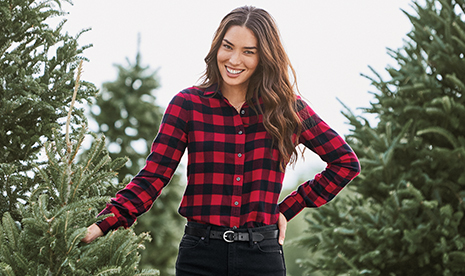 The Lands’ End collection of blouses and shirts for women covers every season in style, with many innovative details and fabrics that set them apart. And each and every one is finished to a very high standard, with quality. Guaranteed. It’s easy to think of blouses for women as a modern day thing, but in fact, women have been wearing blouses and shirts since the Victorian and Edwardian ages of the 19th century – and they became really popular again in the 1920s and 1930’s as a fashionable and economical daywear option. Blouses were a way for women to mix and match tops with skirts to create a whole range of different outfits for every occasion (and that is still the case today). In the early 20s, blouses were very feminine and detailed with delicate necklines, pretty sleeve details and finished with pintucks and lace trims, tiny buttons and lots of embroidery and beading to make them extra special. Later on, in the mid twenties, the pretty details of the early years disappeared and were replaced with more masculine features – sharp pointed collars, neat cuffed sleeves and buttoned fronts. For a sportswear feel, the men’s button down shirt was adapted with a more feminine shaping through the waist, prettier gathered sleeves and smaller chest pockets – women even wore a slim tie to go with it!